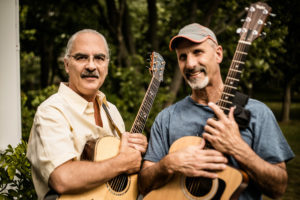 The Hickory Ridge Concert Series welcomes the Chicago folk duo Blind Hills to their stage in the auditorium of the Dickson Mounds Museum. Blind Hills is the acoustic duo of Chuck VanderVennet and Diccon Lee. Whether inviting audiences to sing along with a much loved folk song or introducing them to a new original musical journey, Blind Hills entertains with songs that touch the heart. Chuck is known throughout the area for his deep knowledge of folk music, both traditional and new. He has an uncanny ability to feel what his audience needs. When Chuck is entertaining, folks find themselves happily singing along and joining in on the fun, no matter how shy they thought they were! He can often be found helping behind the scene at shows, emceeing festivals and making radio appearances. Chuck also is an accomplished writer, with a knack for creating hummable tunes. Diccon loves to write and perform original music. Though his tunes explore many themes from spiritual to humorous, the beauty and power of nature is often woven into or the central theme in his songs. His work has been used in traveling theatrical productions, regular radio rotation and inspirational spiritual gatherings throughout the world. The Hickory Ridge Concert Series is hosted by singer-songwriter Chris Vallillo. The series takes place on the 3rd Saturday of every month and begin at 7:00 p.m. with the doors opening at 6:00 p.m. Coffee, drinks, and a variety of desserts are available during intermission. For more information call 309/547-3721 or TDD 217/782-9175 or go to www.hickoryridgeconcerts.com.